In 2004 all I wanted for my sweet sixteen was a copy of Adobe After Effects and some footage to edit. My wish came true when I got a copy of Adobe’s Creative Suite Production Premium and found the Prelinger and Ephemeral Films archives on The Internet Archive. Eventually I came up with a game, a post production game. Search The Internet Archive and construct a story from what you find. Playing with archive footage always presents some challenges where quality is concerned. Give it some type of texture i.e paper, old VHS, pixelated ect. One approach to take is if it’s all pretty messed, up mess it up some more. 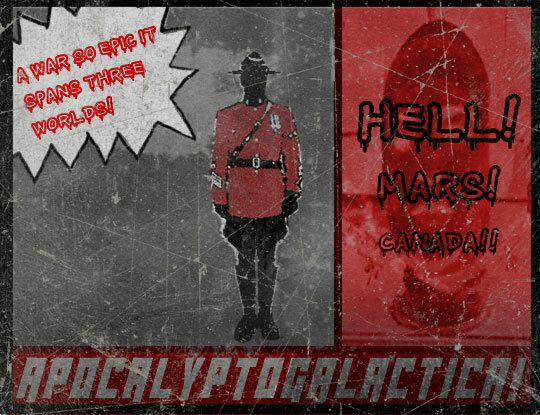 Apocolipto Galatica was another Archive mash-up I was working on but I ran out of mounties. If it wasn’t for open knowledge, public domain and creative commons I wouldn’t have anything to play with.